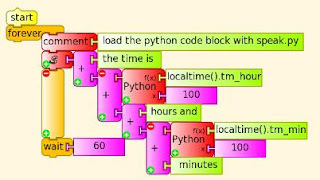 Turtle Art can do text to speech using the Python code block. Enter the following code in Pippy. Load the code by clicking on the python block. Clicking Start will say whatever is plugged into the right of the Python block. The + operator can process strings and numbers. Somewhere under the water is my driveway and the bridge across the creek. I am expecting that the water will fall some time this afternoon or tomorrow. Had 165mm rain overnight, moisture left over from cyclone Yasi in the north is combining with an upper level trough and a cold front down here in the south. Last time I was flooded like this was February 2005 and my recollection was that it was called a 1 in 200 year event.